The South Australian Government seems to have made a point of honouring the Australian's who fought in the Vietnam war by naming crossover points of an expressway after various famous battles during the conflict. Possibly the most famous being the battle of Long Tan. Being born at the very beginning of the 1970's it's a war most people of my generation probably know very little about. It's not like the World Wars that get taught in most schools - especially the history behind ANZAC day (which is on April 25th). It's more like the Korean War, except without the comedy of TV shows like M.A.S.H. to popularize it in modern culture. The most my generation really knows about the Vietnam War (unless they've actually done research) is that it was a massive failure for the U.S.A. and by default Australia. People protested it. There's was some chemical called Agent Orange that was extremely toxic to just about everyone and that many war heroes in movies claim to have "...fought in 'Nam". There's also been a few Hollywood movies specifically about Vietnam, such as Oliver Stone's, Platoon, and probably the most famous of them all, Francis Ford Coppola's, Apocalypse Now. Neither of which give much insight as to what the war was really about since they focus of stories within the war rather than the war its self. I'd always thought that once Western forces moved out of Vietnam that was the end of it but recently learned from an interesting documentary, Operation Babylift by Vietnamese refugee, Dai Le, that the war continued for another two years with South Vietnam eventually falling to the North. I also learned from the same documentary (not surprisingly since this was the film's focus) that about 3000 Vietnamese Orphans towards the end of the war were airlifted out of Saigon orphanages and delivered into the arms of waiting couples in the US, Canada, Britain, Europe and Australia. It was apparently one of the biggest adoption programs ever undertaken in history (and I'd never heard of it?). Just reading the synopsis for the documentary, before even watching it, the very idea is both shocking and confronting. On the one hand you're giving many kids a chance for a far better life than they might have had but at the cost of completely displacing them from their culture, relatives, places and people they know. Interestingly the documentary follows the experiences of three adoptees, transported to Australia and their experiences 30 years later. One of the adoptees has a sister who stayed with her mother through out from the end of the war. Disappointingly the documentary misses an opportunity to contrast the lives of the two sisters other than to highlight that the one that stayed in Vietnam lived a very poverty stricken life. My question is was this sister just lucky to have survived or would her story show that perhaps the 'Babylift' was unnecessary? I have actually digressed on this article. The reason I came to be watching Operation Babylift was that it was presented as extra material for another documentary about Australia's involvement in Vietnam called All The Way. This particular documentary looks at how Australia came to be involved in the war (as a test of newly created alliance between the USA and Australia) and also contrasts how Australian soldiers fought the war using similar tactics to the Viet Cong with America's 'Shock and Awe' strategy of bombing and burning anything that looked even remotely hostile. It does make the American Military look extremely ineffective in their approach to war whilst the Australians seem to have been able to hold their own and adapt, even when outnumbered dramatically, such as in the battle of Long Tan. Almost to the point where I was wondering how did the American Marines get such a reputation as a fighting force with military strategists commanding them that seem to think bigger, louder and greater numbers wins every time? Kind of reminds me of Afghanistan and especially the Iraq war in the beginning. Almost seems like America suffers so many more casualties in war because they don't actually take the time to learn how to fight their enemy... it's just we're bigger, louder and there's more of us so we, naturally will win... kind of the mistake that the Viet Cong made at Long Tan... almost. Haven't these people ever read the story of David and Goliath? Anyhow, All The Way is an Australian documentary so for all I know it could be a little bias or just straight up propaganda for talking up our involvement in Vietnam. Never the less it is interesting to learn more about this war and get some real insight into what it was really like. Especially if you can get some insight from actual soldiers - which is very rare for many reasons. However another of the documentary extras I saw was interviews with Australian Soldiers, years after they'd returned from Vietnam, and the psychological trauma they suffered as a result of being sent to Vietnam. Called What was the war like, Love? (I haven't been able to find a good link to it), it features a particularly moving account of one soldier who unfortunately shot a mother and child believing them to be Vietcong and realizing too late that they weren't. As he points out it's not the kind of thing you can tell people and receive understanding and sympathy for. 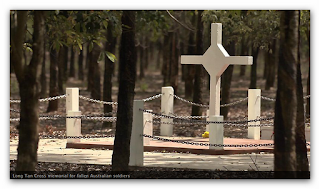 If you're interested to know more about Australia and the Vietnam War then there is a good website titled exactly that, Australia and the Vietnam War. Keen observers may even note a menu link on the site known as The Tet Offensive. Nothing to do with me, though I've known for a few years that Tet is actually the name of the Chinese New Year holiday period.